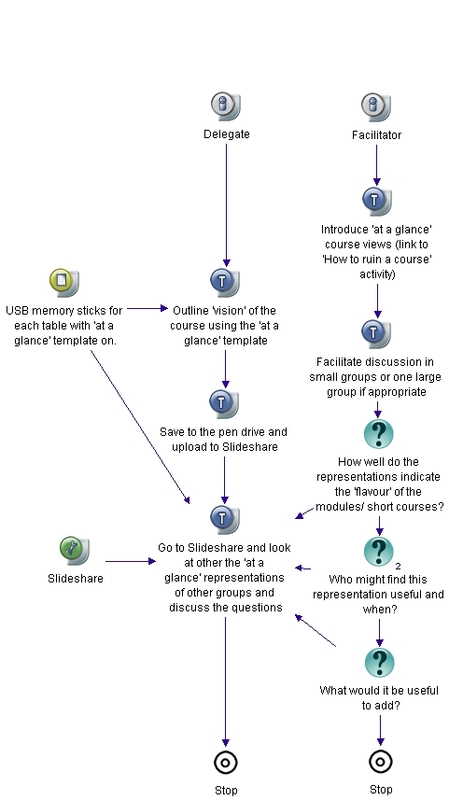 The 'at a glance' representation gives a one-page overview of a module or course and can effectively communicate the 'flavour' or 'vision' of the course. 1. In your team, and using the Word proforma on the pen drive, outline your 'vision' of your module or short course. 2. Save a copy to the pen drive. How well do the representations communicate the 'flavour of the course'? Who might find this representation useful and when? What would it be useful to add? The MSB team is happy to have uploaded our proposed module design using blended learning methodologies on 'Inter-Profesional Ethics'. Our group consisted of inter-disciplinary team members from OT, physiotherapy, community nursing, bio-sciences and social work. The common theme in our group is inter-professional practice and a concern about ethical issues in practice. This module aims to provide a global ethical framework for multi-disciplinary practice teams.